Home › How To Make Felt Ball Garland The Proper Way! How To Make Felt Ball Garland The Proper Way! How to make felt ball garland? The great thing when it comes to making a felt ball garland is that you don’t need a lot to get started. And most likely, you probably have few things that you need lying around at your place already. By the way, you can go to our how to make felt ball garland under 5 minutes, if you want to learn the quicker method. Things you need to make felt ball garland. To make felt ball garland, you will need felt balls and if you want to add some different flavours, you can use felt stars, felt hearts and felt glitter balls too. Most commonly 2 cm felt balls are used to make felt ball garland. If you want to add bit of variations on your felt ball garland, try using some different sized felt balls like, 3 cm or 2.5cm. 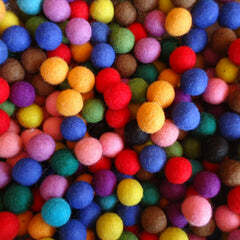 And most importantly, choose the right colour combination of felt balls for your felt ball garland project. For this video tutorial, we have used 2 cm felt balls in some bright colours. We have a tool to guide you how many felt balls are needed to make felt ball garland. There is not hard and fast rules on what kind of cord or string you need to use when you want to learn how to make felt ball garland. We just recommend you to use something not that thick but strong enough to hold the felt balls. Typically, you can use nylon string, even fishing line, or cotton thread is great for this kind of project. Always cut long enough string so you can make loop on both ends. Example, if you want to make a 1 meter, 2 meter or any other length garland, we recommend you leave 20 cm extra length on both ends. This way, you can make a loop so the felt ball garland can be hung on the wall. We advise you to use a tapestry needle with a medium to large head. It depends on the thickness of the string that you are going to use to make a felt ball garland so needle with larger head is probably is a better option. Any kind of scissors is good for this felt ball garland diy project. This is a great tool to have to make sure you have the right length cord or string to make the felt ball garland. We advise you to have the string at least 20 cm longer than your planned felt ball garland. This allows you to make a loop or hook if you like, to hang the garland. Make sure you decide on the colours before you begin making your felt ball garland. Just play around with the felt balls and put them in different colour orders until you are satisfied with the sequence. Make a note of the colours and the sequence on a piece of paper once you are completely satisfied. As a guide, you will need about 15-20 felt balls for every 1 meter felt ball garland. If you haven't got the felt balls and you wan to preview the garland, you can go to felt ball garland and click on "custom garland". Here you can play around with the colours and see how your felt ball garland looks like. Measure the string or cord and make sure you have that extra 15-20 cm extra length for later use. Once you have measured, cut the thread with the pair of scissors. Make a little knot with your finger at the start of the thread like shown on the video. Make the first loop. This can be done now or at the end. If you want to make the loop now, just follow the steps in the below 4 images. Now just thread the needle, and string up your felt balls. Threading up the felt balls are fairly easy process. Just make sure you thread the felt balls from the centre. Once you thread the felt ball, it normally sticks to the thread but to make sure you want to stick the felt balls at the desired position, just do a tiny loop knot as shown below. This may look bit unnecessary, but it will make the felt garland stronger when it's all completed and you can use it many times in future. It's really up to you, how much space you want to leave in between the felt balls when you thread them through the string to make a felt ball garland. As a guide, we recommend you to leave about 3-4 fingers gap between the felt balls. See below image for guide. Make sure you make a little loop at the end so you can hang the felt ball garland when the project finished. Steps are shown on the video or you ca follow the steps below. Once completed, you can hang them anywhere you want. Hope this quick tutorial on how to make felt ball garland has helped you to make your first felt ball garland project.